GMM Minigrad within the draft manual production models of tractor modifications AT S-712 released model BM-24 (ATS 712). Scale model 1:43, metal material. Master model Mihailov V.A. , Assembly Sokolov O.N. Workshop YVS-Models released two models of car modifications MoAZ-6999. Scale models 1:43, Foundry plastic material. Workshop YVS-Models released car model BAZ-6306 truck with canopy. Scale model 1:43, plastic, tyres Foundry material rubber, manufacturing specialized workshop from Kharova. Workshop YVS-Models released a model gun 2A36 Giacint-B 152 mm. Scale Model 1:43 Foundry material plastic, metal barrel, rubber tyres, production of the specialized workshop from Kharkova. 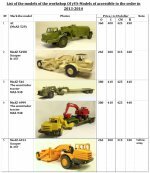 Workshop YVS-Models in the addition of the program of output of the models of the automobiles Of [moAZ] let out the model of the automobile Of moAZ-529M in the version with the scraper D -357. The scale of model 1:43, material is foundry plastic, wheel rubber of the production of the specialized workshop from Kharkova. In the model the swivel gears work and ladle moves. 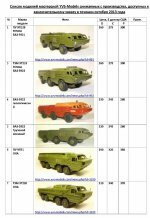 Workshop YVS-Models let out the model of the semitrailer tractors Of moAZ-546 and MoAZ-6999 with the semitrailers by servicemen and civil. Scale 1:43, the material of models foundry plastic. Workshop YVS-Models let out the model of automobile BAZ-69481M in the version of cargo chassis. Scale 1; 43, material is foundry plastic, wheel rubber, the production of the specialized workshop from Kharkova. Workshop RO-Models let out the model of automobile TATRA-147DS5A. Scale 1:43, material- foundry plastic, wheel- rubber of the production of the specialized workshop from Kharkova. Workshop YVS-Models let out the model of automobile BAZ-6944 the all-passenger layout. Scale 1:43, material- foundry plastic, wheel- rubber.